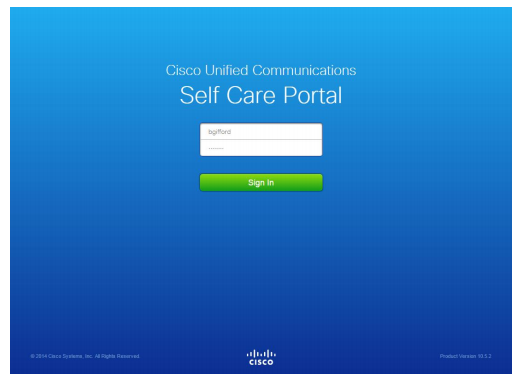 To access the Cisco Self Care Portal, you must be on the campus network or using a VPN connection. You can access the Self Care Portal two ways; Option 1: Cisco Jabber Desktop; Option 2: Web browser. Step 1: Open your Jabber desktop client using your Jabber username and password. Step 2: Select the Gear icon from the top right corner of the client, the File and Options button. password and clicking Sign In. One option will show your Phone model with your name. You may see other options, such as mobility, depending on your phone configuration. Step 1: From your web browser enter https://cmpub.nccu.edu/ucmuser/. You might get a security certificate error when trying to access the website. Select process anyway if you receive this error. Step 2: You will be prompted to enter a username and password. The login credentials are the same as your computer login and password. Once username and password have been entered, click the green Sign In button. · Phones – Allows you to view and configure your phone settings such as speed dial numbers, ring settings, call history, and call forwarding settings. · Voice Mail – Allows you to change your voicemail preferences. · IM & Availability – Allows you to set up Do Not Disturb on your phone that will mute your ringer. · General Settings – Allows you to change your client/portal password and modify your phone PIN. 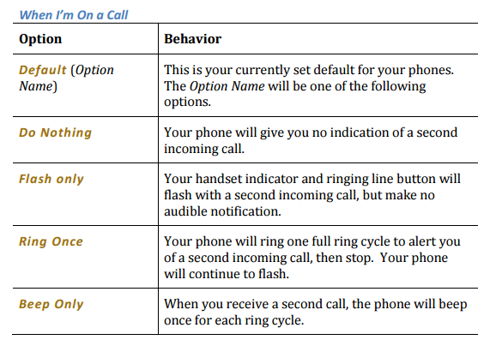 Note: Some settings that appear in this document may not appear when you set up your phone in Unified Communications Self Care portal due to phone capabilities and North Carolina Central University security parameters. The Self-Care Portal uses the following icons to execute common functions. My Phones – View a summary of your phone(s) and add new phones, edit line descriptions. Phone Settings – Ability to configure phone settings such as speed dial numbers, call history, and call forwarding. Call Forwarding – Configure call forwarding options for the VoIP phone(s). The My Phones window displays a summarized view of your company phones and any additional phones where you can be reached when you are not at your desk. 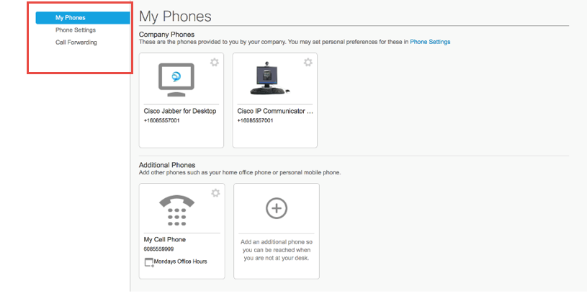 Click the desired phone in the Company Phones section you wish to modify. Two options, Edit and Settings, will be available. Available options that can be used in this area include Speed Dial Numbers, Services, Voicemail Notification Settings, and Call History. Speed dial numbers allows you to quickly call contacts or associates in or outside your organization. 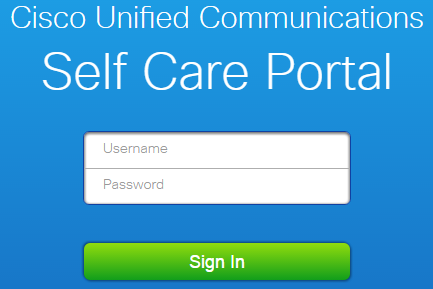 Through the UC Self Care Portal, you can set up to 199 speed dials for your Cisco IP Desk phones. Step 1: Click the Phones tab. Step 2: Click Phone Settings. 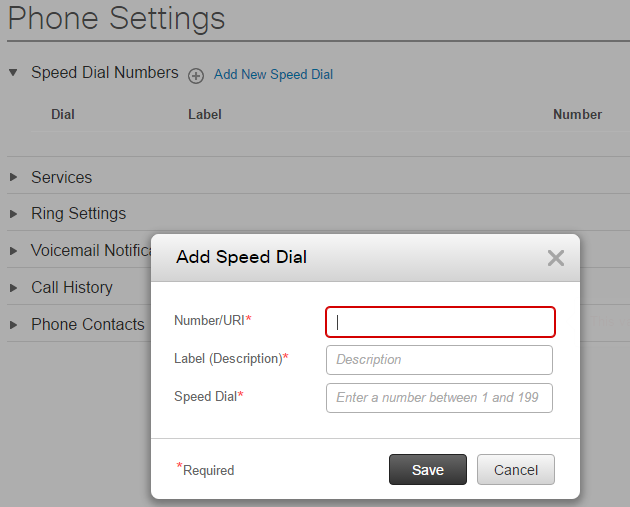 Step 3: Click Speed Dial Numbers in the Phone Setting section. Do the following: Select the phone for which you want to add the speed dial number, and then ADD New Speed Dial. Step 4: In the Number field, enter the contact’s name or phone number. You can only search the company directory if your network administrator has enabled you with access. (4-digits for internal contacts, 9 + 7digits for external numbers, etc.). Step 6: In the Speed Dial text box, assign a speed dial number. Allows you to change the default behavior of your phone for alerting you to new calls based on the current state of your line. Voicemail notifications allow you to set up how you want your phone to notify you that there are new messages. Step 3: Click Voicemail Notification Settings. Step 4: For each of your phones, check the notification options that you want to apply to your phones. Call history allows you to log missed calls for each of your phones. Step 3: Click Call History. 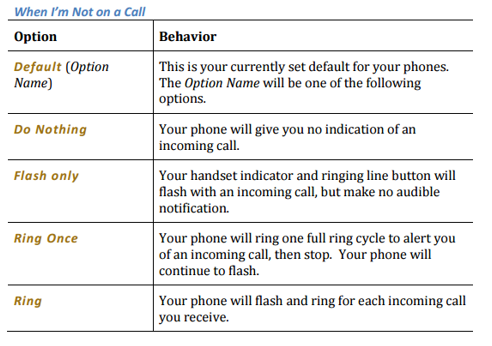 Step 4: Check the Log Missed Calls check box for each phone line that you want to save the call history. When Forward all Calls to check box is checked, all calls that you receive on the phone line will be forwarded to another phone line. Step 2: In the left navigation pane, click Call Forwarding. Step 3: Click the phone number on which you want to set up call forwarding. Step 1: Check the Forward calls to check box. 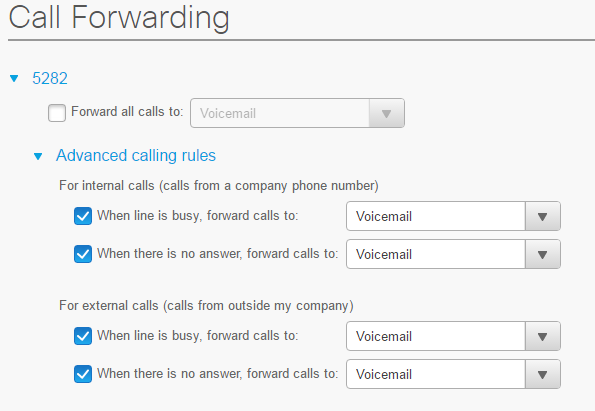 Step 2: From the Forward calls to drop-down list box, enter the phone number to which you want to forward all calls. With Unified Communications Self Care Portal, you can set up advanced call forwarding options, such as call forwarding behavior that is different for internal calls than for external calls. Step 4: Click Advanced Calling Rules. 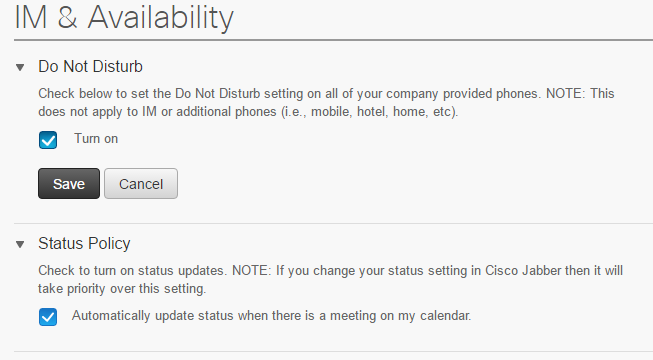 In the IM & Availability section, you can set your Do Not Disturb and Status Policy preferences. If Do Not Disturb box is checked, your phones do not ring when someone dials your number. Step 1: Click the IM & Availability tab. Step 2: Click Do Not Disturb. 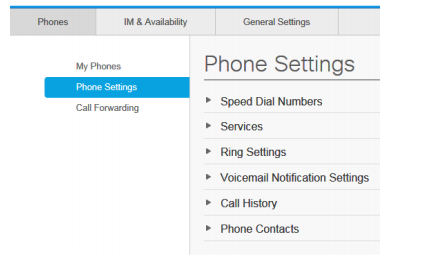 The General Settings menu item gives you the option of setting new phone services PIN. The Phone Services PIN is used for Extension Mobility, logging into another Cisco IP Desk phone so your personal preferences, such as Speed Dial Numbers, contacts, and call forwarding preferences, are available to you whether you are sitting at your own desk or not. Step 1: Click the General Settings tab. Step 2: Click Phone Services PIN. Step 3: In the New Phone Pin text box, enter your new PIN. Step 4: In the Confirm Pin text box, enter your new PIN. For more information, visit the Self Care Portal User Guide.